If you move a wire near a magnet you can make current flow through it or current is induced in the wire. This is called electromagnetic induction. If the following experiments wires were connected to a galvinometer that would deflect if there was current. The further the deflection the more current there was. When the wire was moved up and down the galvinometer deflected. It deflected opposite ways if moved up or down but did not move if the wire was held still or moved from side to side. The deflection was more if the wire was moved faster. The deflection was more if the wire was looped into a coil. 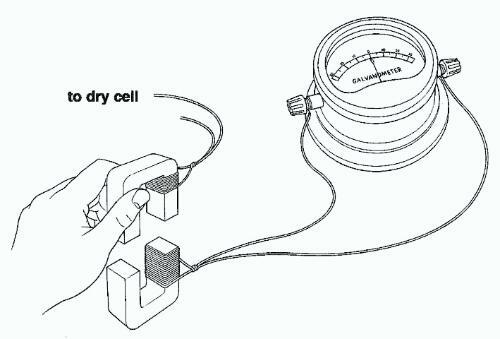 If you move a magnet into a coil of wire the galvinometer deflects. If you pull the magnet out the galvinometer deflects in the opposite direction. The faster you move the magnet the greater the deflection. If you keep the magnet still there is no deflection. If you move the magnet towards or away from the coil there is a deflection. If you hold the magnet still there is none. The deflection is greater than in previous experiments. If you move the c-core with current in it towards or away from the coil. There is a deflection. If you hold it still there is none. If you place the coils together and switch the current on and off there is a deflection but not if you leave the current constant. The field lines from the magnet run between the magnets. When the wire cut through these magnetic field lines at right angles, a current was induced in the wire. It had to be moving to induce a current. The direction of the current depended on the direction of movement of the wire. The faster the wire was moved the larger the induced current. The induced current was larger if the wire was coiled. 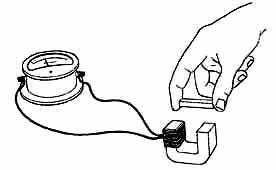 Moving a magnet in a coil of wire induces a current in the wire. The direction of the current depends on the direction of motion of the magnet. You can increase the current by moving the magnet faster, increasing the number of coils or increasing the strength of the magnet. Moving the magnet near the coil induces a current in the coil. This will be a stronger current than before as it has an iron core. The core with the current carrying wire wrapped around it is an electromagnet. Moving the magnet near the coil will induce a current in it. If you switch the current on and off, you are changing the magnetic field. This is the same as having a moving magnetic field: a current is induced. Moving a wire near a magnet or a magnet near a wire will induce a current in the wire. The movement should be perpendicular to the magnetic field. 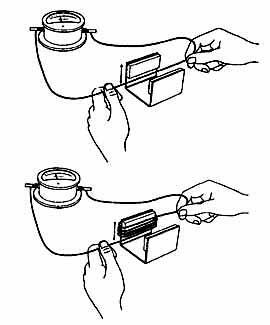 The current can be increased using an iron core, coiling the wire and making the movement faster. A changing magnetic field induces a changing electric field or a current. The current starts to flow or the electrons start to move because charged particles will experience a force in a magnetic field and electrons are charged.